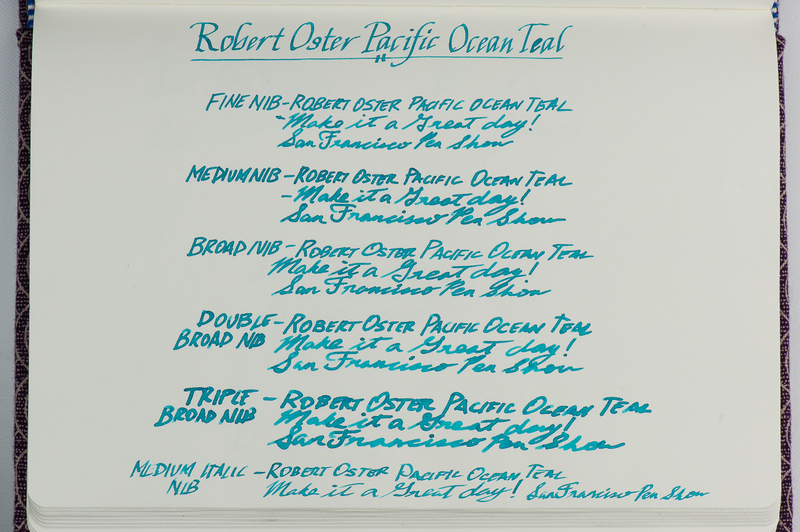 We are very thankful to have received a bottle of this Pacific Ocean Teal ink from the San Francisco Pen Show group for review. 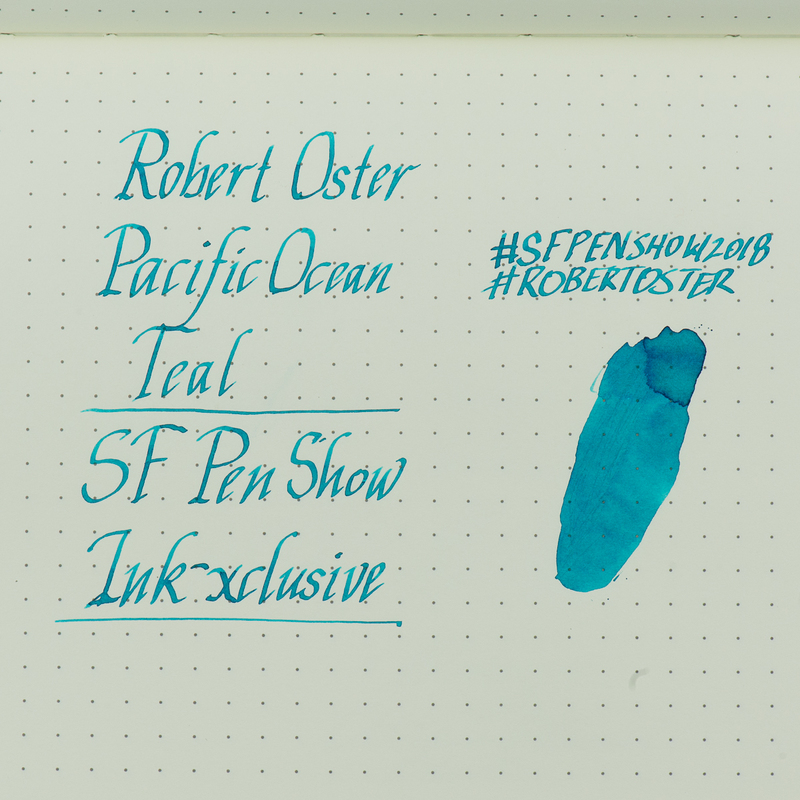 They have commissioned Robert Oster Signature Inks in Australia to create an exclusive ink for the 2018 San Francisco International Pen Show to commemorate their Fifth Anniversary. 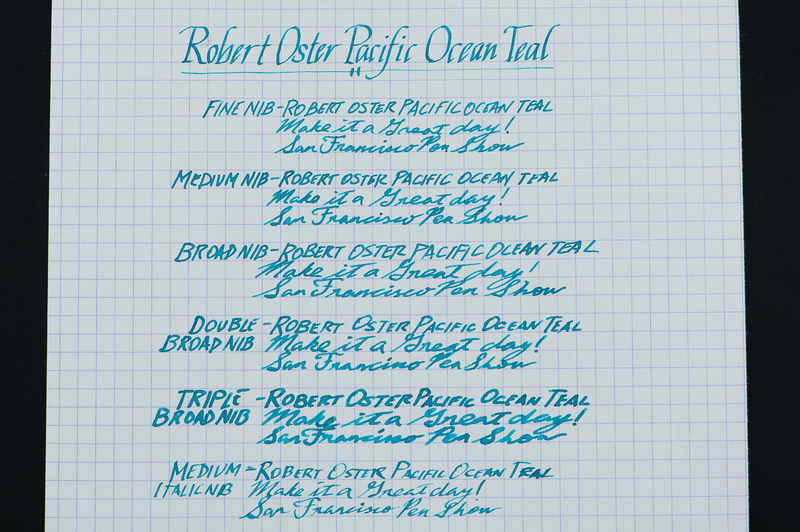 They wanted a nice teal that shades and Robert Oster delivered! 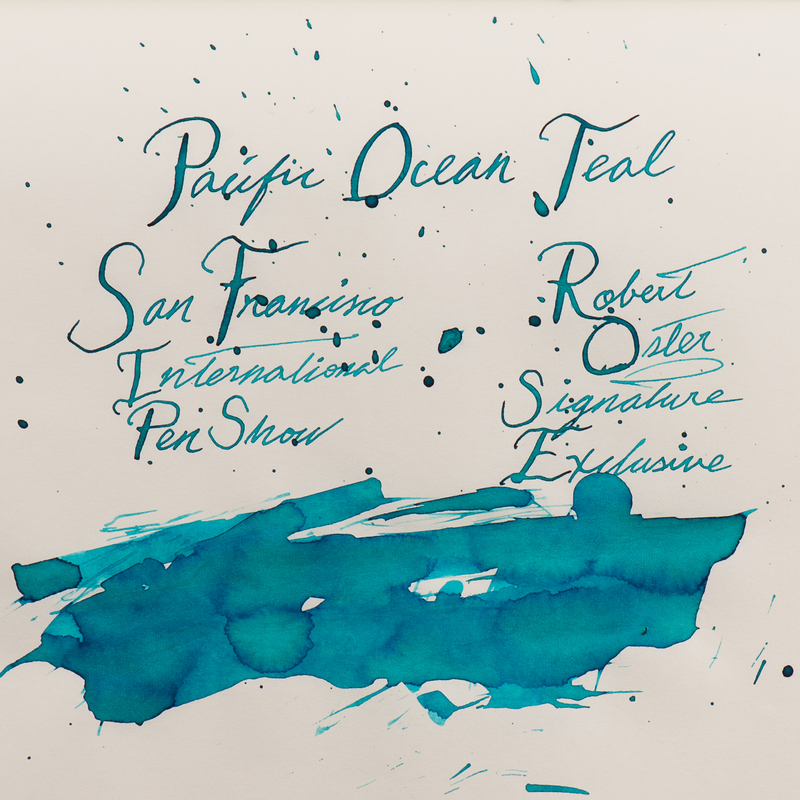 The Pacific Ocean Teal ink bottles will be on sale at the pen show happening this weekend, Friday August 24 until Sunday August 26. We are told that supplies are limited so act fast! They will be sold near the show’s registration desk in the foyer area of the Pullman SF Bay Hotel in Redwood City, California. 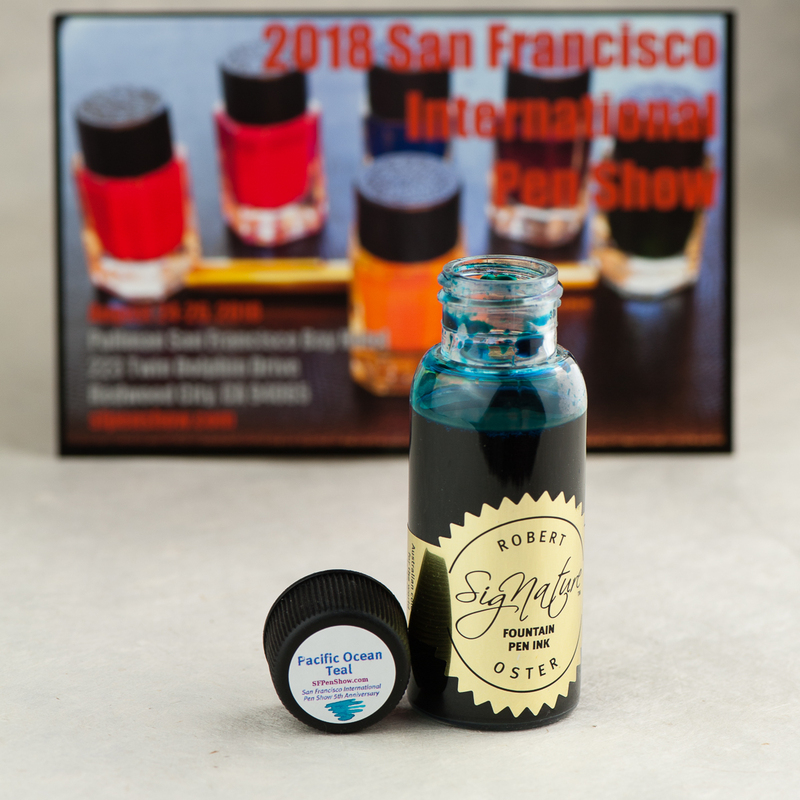 For more information and details of the San Francisco Pen Show, check their website at: www.sfpenshow.com. Katherine: It’s pretty! 😀 I prefer it in drier nibs (as pictured below) where it’s lighter and shows more shading. In wet nibs it just looks black. Overall it seems well behaved, and maybe a touch on the wet side. And oddly hard to photograph! Franz: Teal, this color is in the realm of my favorite color which is blue. I say that like nobody knows it. hehe.. 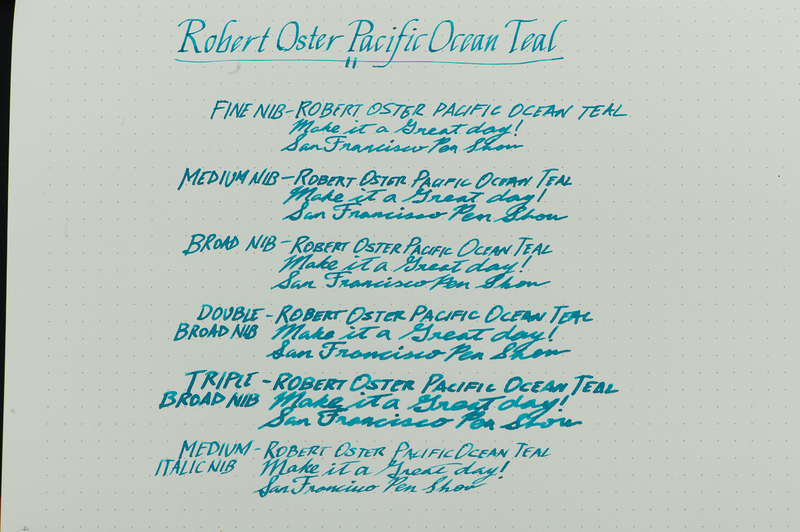 Anyway, inks made by Robert Oster are always well-behaved and are a treat to write with. 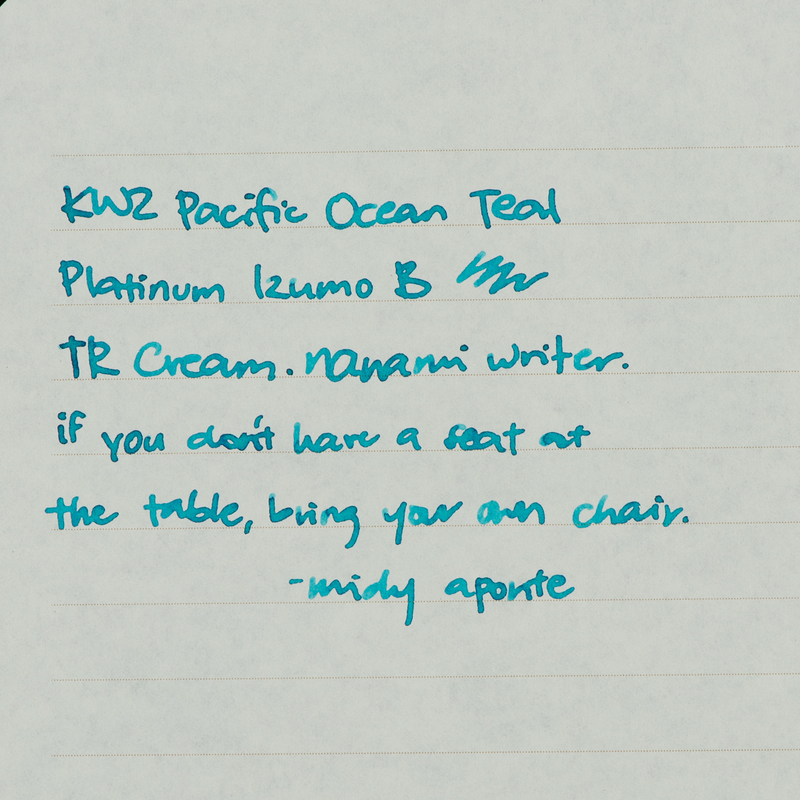 This Pacific Ocean Teal is no exception. I’ve used the ink in different pens and they all wrote well consistently. My writing samples shown below were made via a Pelikan M800 because of the full range of nibs but I actually used a medium nibbed Vanishing Point at work with this ink and it was great as well. 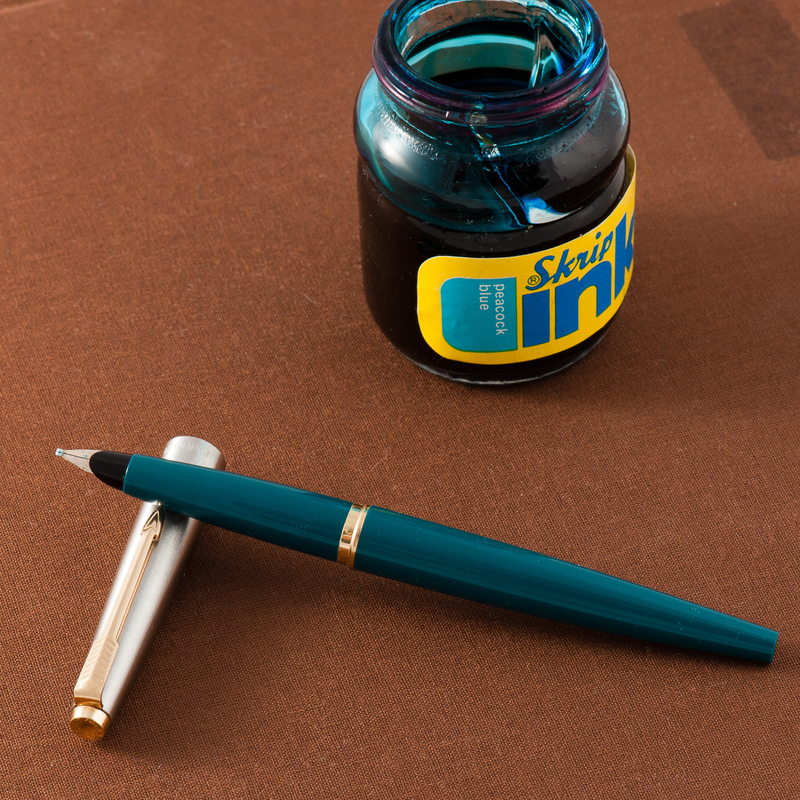 The color of this ink is very close to what you find when you do an internet search for teal and that’s pretty cool. This ink may be at the medium to high in wetness for me but the dry-time isn’t too long. Some folks look for sheen and it’s there but not too much. It does show up in broad nibs or in flex writing if people really want that. But what I really like with this ink? It’s the shading for sure. You can use an extra fine nib up to even a triple broad nib and the shading is there! Overall, I really love this ink! 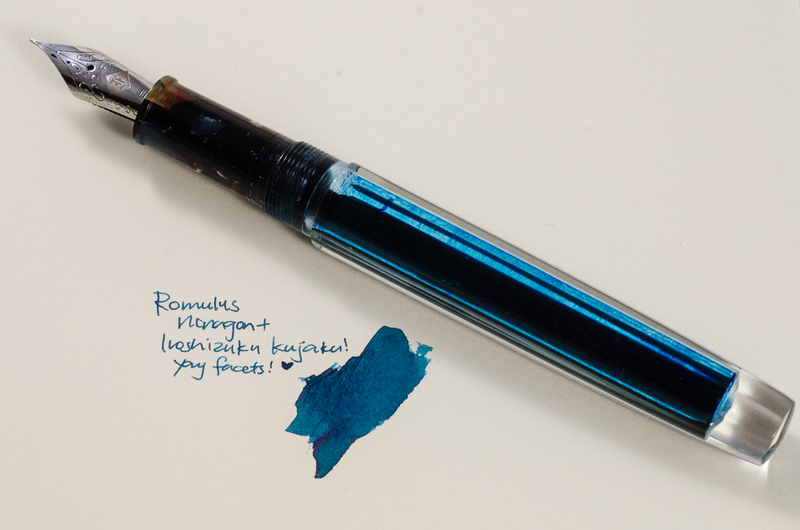 I don’t have many teal inks because my taste in ink color seems to lean more towards the blue side but this color is a fantastic one. I hope to get a bottle (or two) for myself at the show. 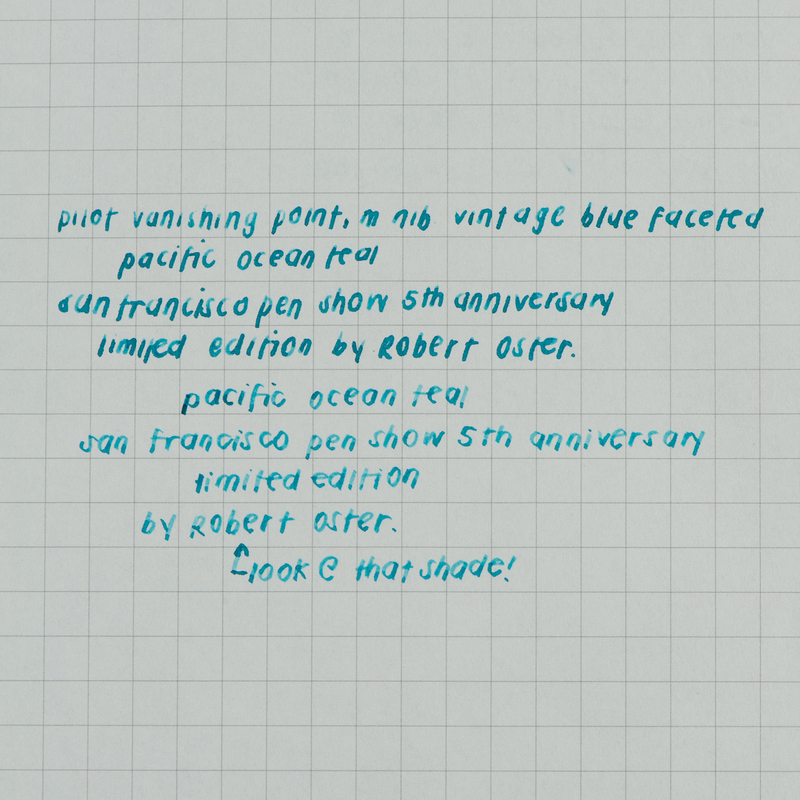 Pam: I had my reservations when I heard that the SF anniversary ink would be “teal.” Not another blue ink! However, I was pleasantly surprised. It’s. definitely within the blue family. 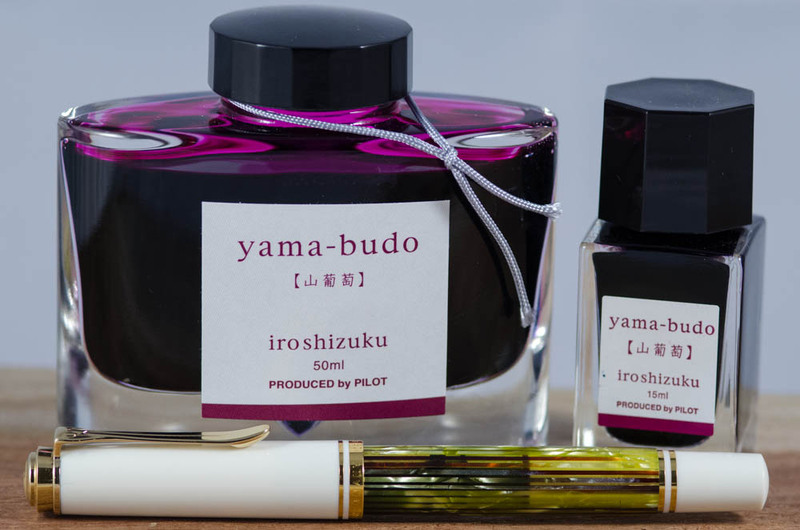 It has the warmth and clarity of color that I loved about Iroshizuku Tsuya-kusa. The color reminds of Pelikan Turquoise. Albeit, it’s lighter than Turquoise and capable of some shading. I didn’t detect sheen when I have been using it. The ink is well behaved in my book, producing lines that are as expected. It may lean wet, but only by a smidge. It runs really well through EF and F nibs, which is greatly appreciated. I don’t see a loss in color or saturation unless I am using in a really dry nib like my architect. Overall, I would recommend this ink. It’s a beautiful color, reminiscent of the ocean blue waters surround our Golden Gate. I can see it being very dynamic for a calligrapher or any that experiment with a dip nib. The shading would be pretty great with this ink. Yet, it’s still readable, pleasing to the eye and can be used on a regular basis for your flair of “blue” in the office. Katherine: As many of you know, I’ve been “upgrading” my collection at a pretty rapid clip over the last year. The SF Show quickly approaches and about a year ago, my most expensive pen was a Danitrio… but other than that, I’d never spent more than $120 on a pen. 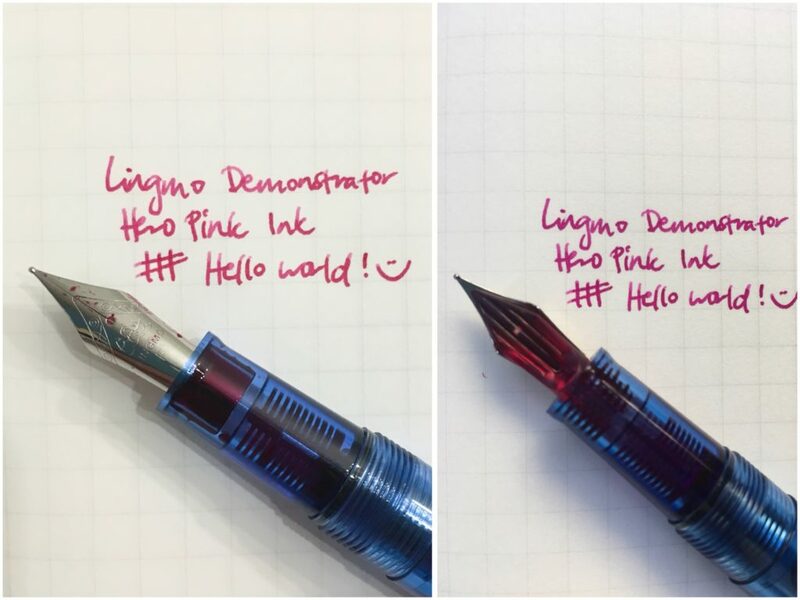 That’s changed quite a bit, so this month I thought I’d revisit the cheaper side of the hobby — I inked up a Lingmo blue demonstrator with some Hero Pink ink (the entire set of ten colors was $30!). 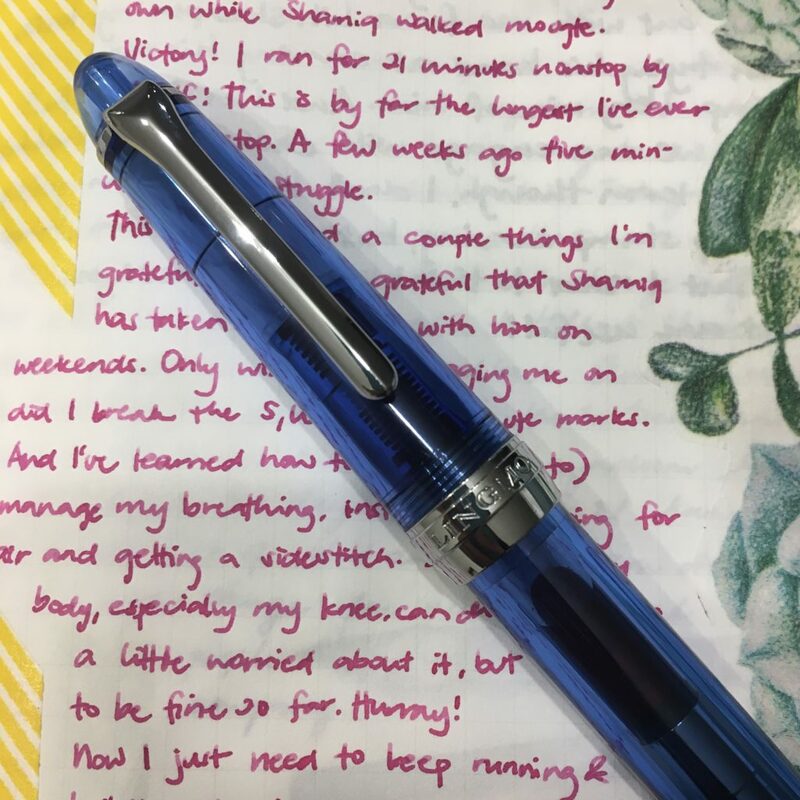 It’s a slim pen, but I love the pairing of a bright ink on the clear feed of the Lingmo! A bright and sunny combo for the summer! Pam: July is the peak of the summer months here in California. My inky homage to the cloudless (and hot) days and swimming pools during this time of year is Sailor Souten! I was lucky enough to get my hands on a Pilot MYU with a Fine nib. (Thank you Andrew!) The feed has a chip on it that creates a wetter ink flow. (It writes more of a Medium Fine to me.) 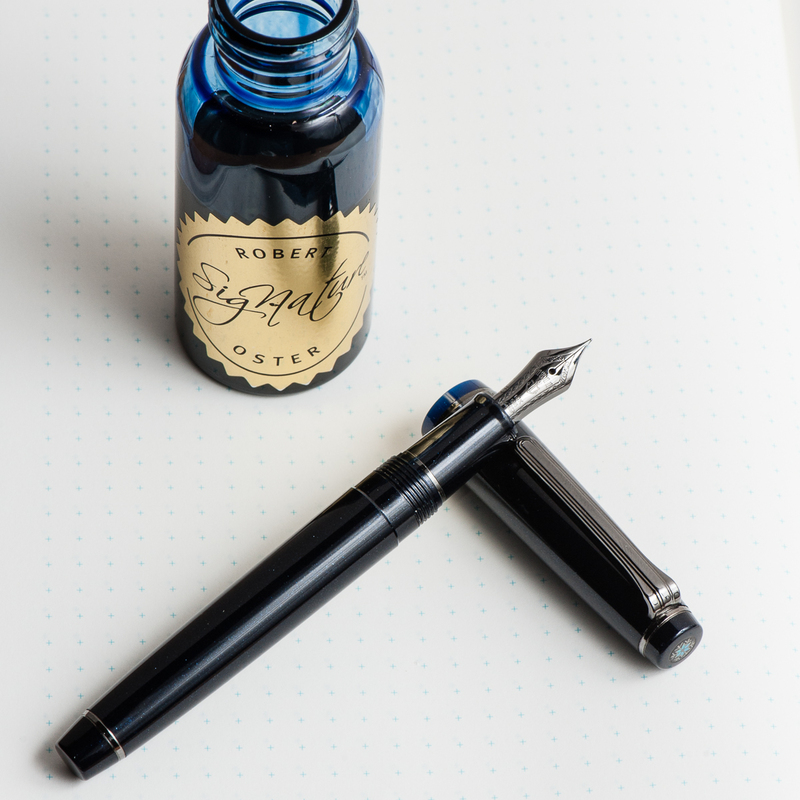 With the extra flow of the pen, and the unique design, I had a hard time finding an ink and pen combination that I loved…until I tried Sailor Souten. Sailor Souten is reminiscent (if not identical) to Sailor Sky High. 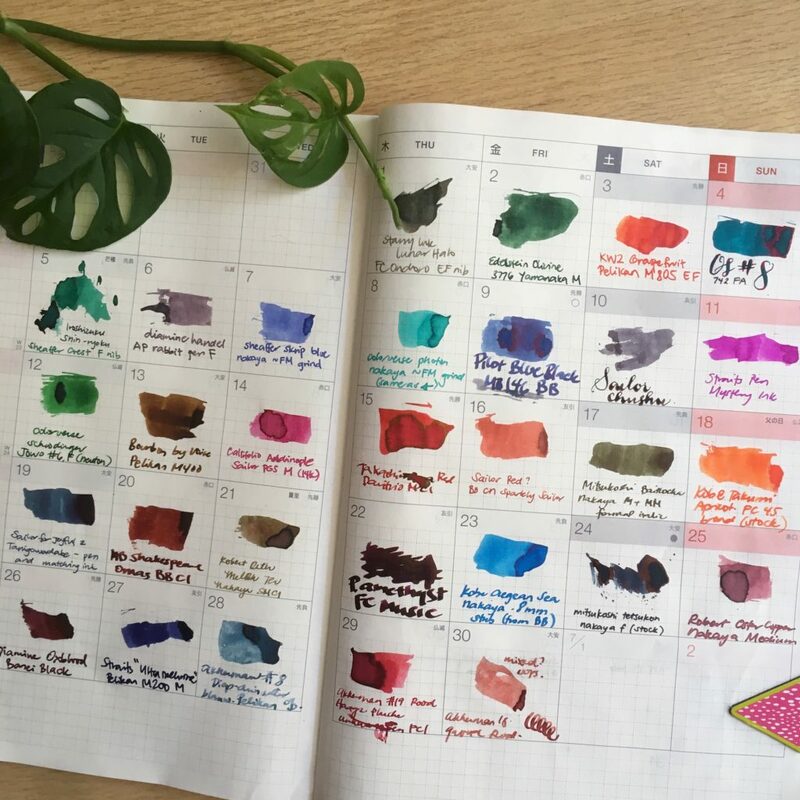 The bright color and sheen really comes through with the extra wetness with this Pilot MYU. The bright color of the ink is a great compliment to the minimalistic design and color of the MYU. It’s like the unexpected bright pocket square to a gray suit. Or maybe this is a pen-ink version of the mullet: The pen looks like it means business, but the ink is a party. Franz: Aww man! July has been a busy month for me and I’m “grateful” that I have my pen friends and my pens to keep me going. #hotpGratefulInJuly! It took me a while to decide which pen and ink pairing I’d be highlighting for July for I have a “few” pens inked up. 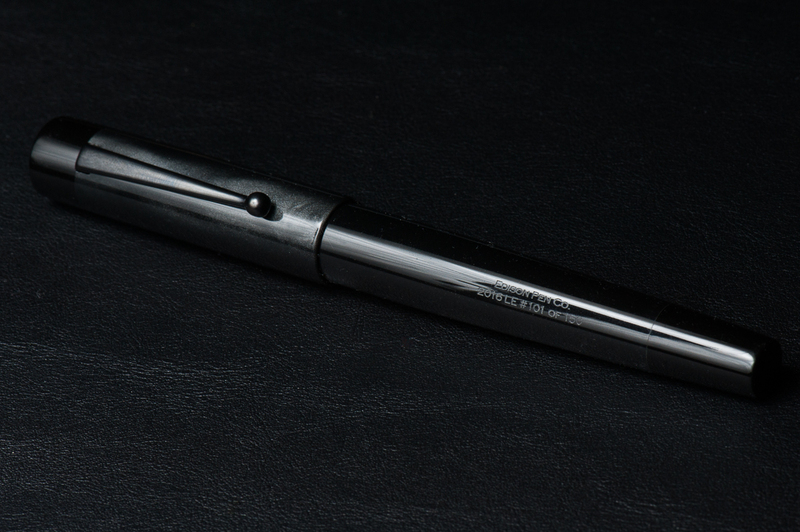 I’ve decided to feature my 2016 Limited Edition Stealth Glenmont from the Edison Pen Co. 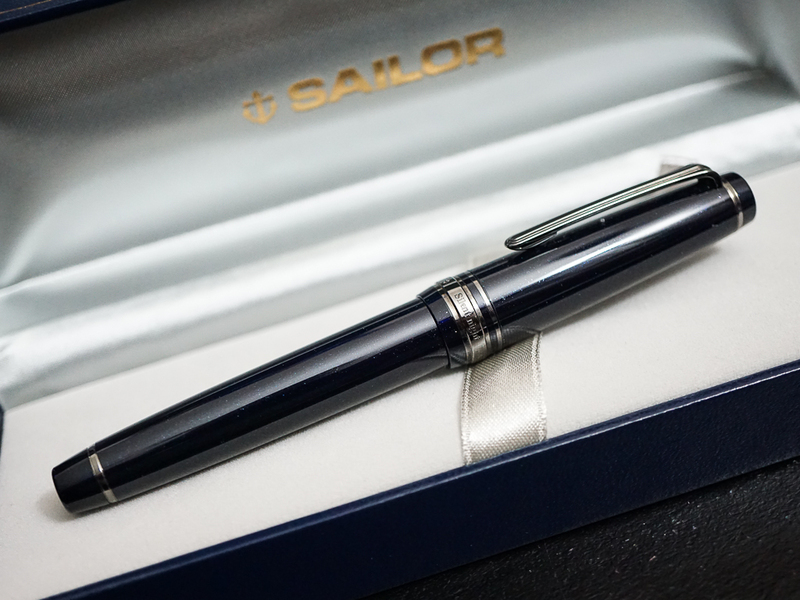 I acquired number 101 of 150 last October of 2016 and I was lucky because this pen was sold out less than 12 hours when it was announced by Brian Gray. Being that this is a black pen, the ink options are unlimited and I initially inked it up last year with a blue-black ink. This month, I was reminded of what my friend Gerald (@mycoffeepot) once said. 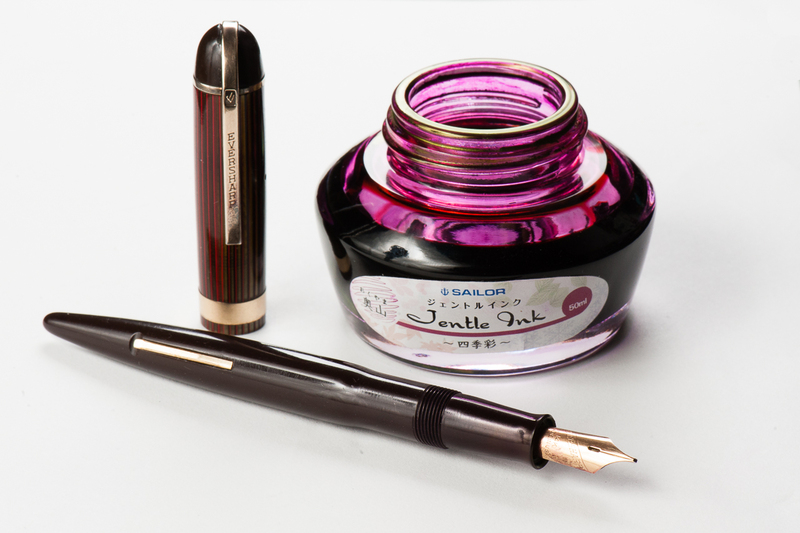 “Stealth pens crave pink ink”, April 2013. (And by the way, he does pen reviews on YouTube) So, I got myself a bottle of Pilot Iroshizuku Tsutsuji and satisfied my stealth pen’s craving. 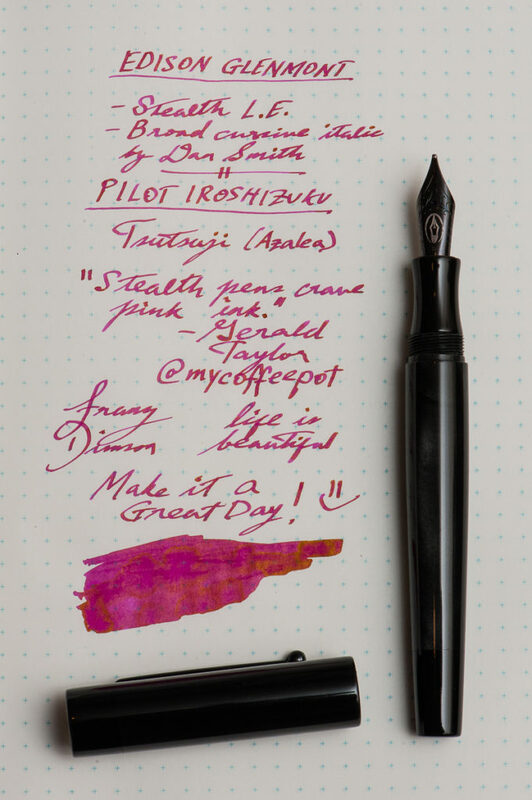 With the broad cursive italic nib customized by Dan “The Nibsmith” Smith, the juicy ink flow brings out Tsutsuji’s gorgeous color. And that sheen! 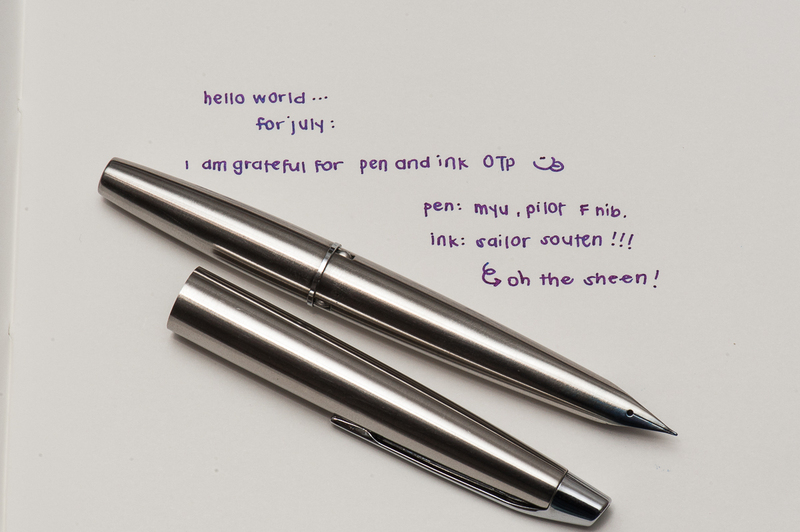 =) I’ve been happily journaling with this pen and it’s almost time to refill the converter. Pam: The skies are clearing up and the hotter spring nights are great for seeing the stars. So my ink and pen pairing for May is the Sailor Pro Gear Slim in the Galaxy finish with Private Reserve Electric DC Blue. The dark blue ink has an incredible red sheen that reminds me of the night sky and the depths of space. The sheen shows up even with the EF nib on the Pro Gear Slim, granted, the nib has a great balance of fine line and wetness. In my not so discerning opinion, the sheen rivals that of the famous Robert Oster inks like Fire and Ice. 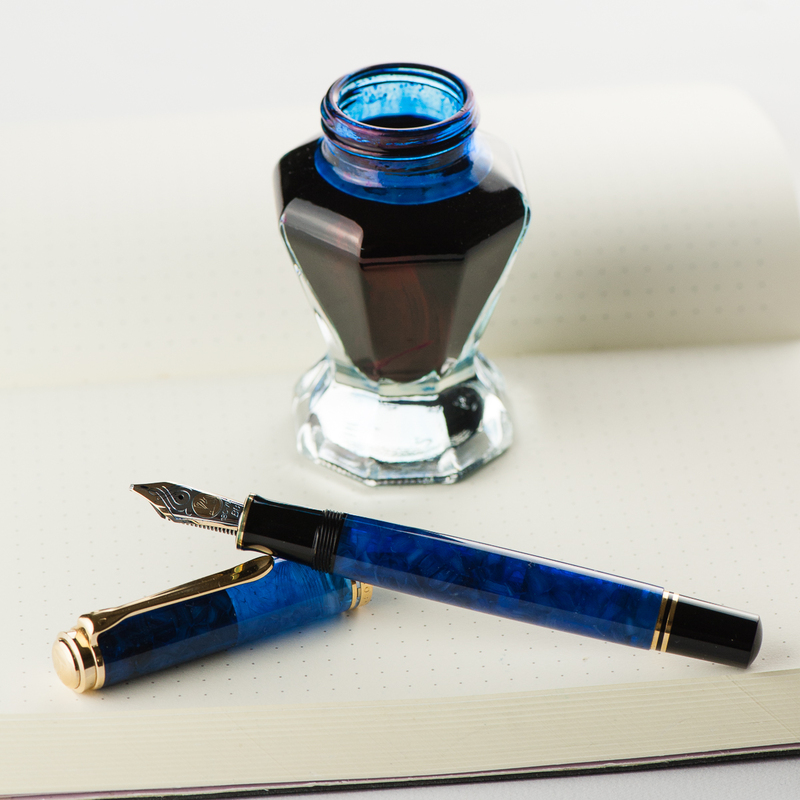 Some people have reservations about Private Reserve or Noodlers inks potentially causing damage to a pen. 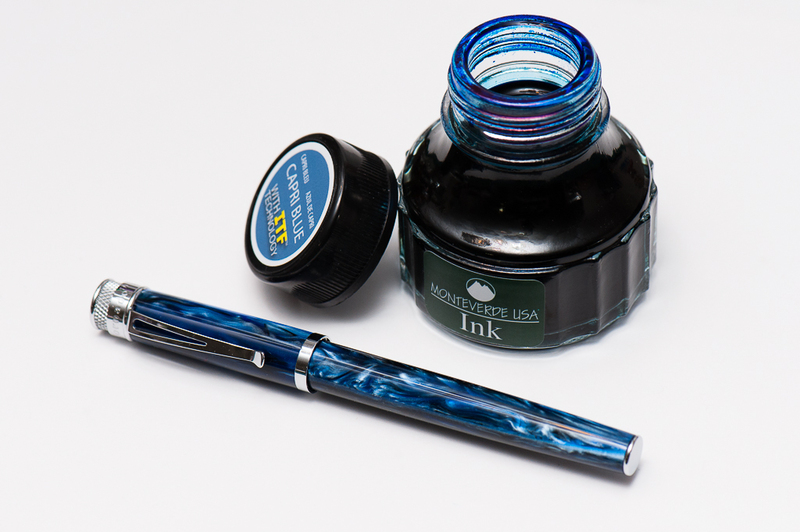 I can only attest for the Electric DC Blue, but I have not had any issue with this ink in my beloved Galaxy. Franz: My pairing for May is a personal (read as emotional) one and please be advised that this will have a different feel from my usual write-up. 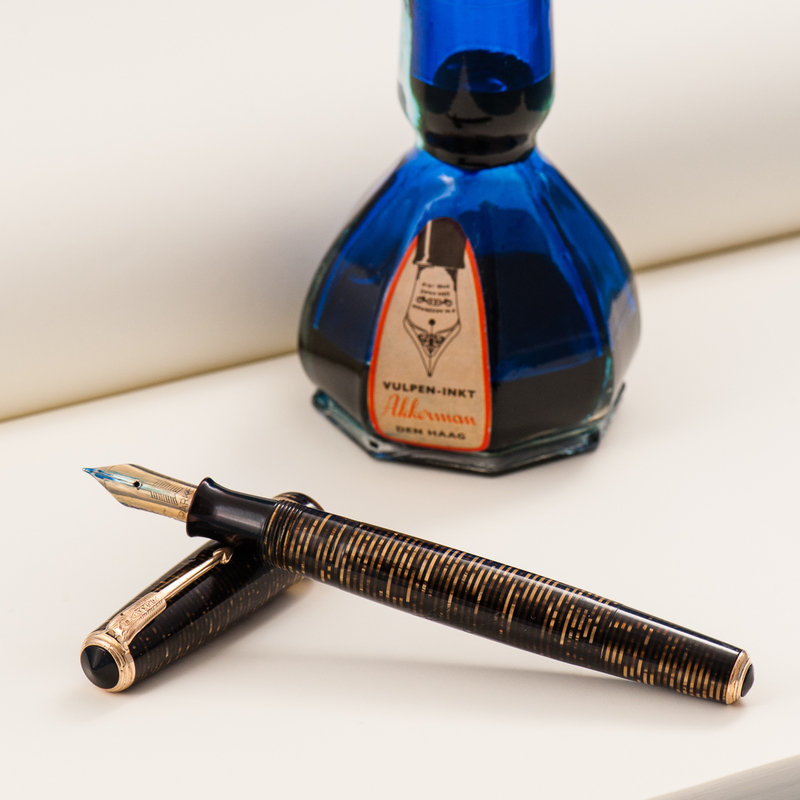 I inked up my Teal Parker 45 with Sheaffer Skrip Peacock Blue ink. 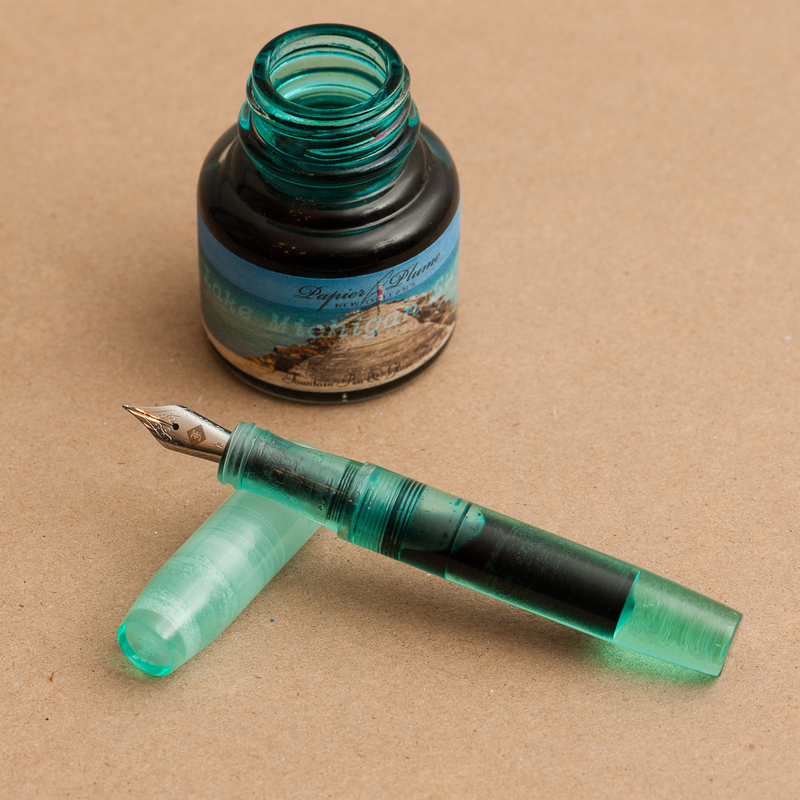 I believe the pen matches this turquoise ink quite nicely. 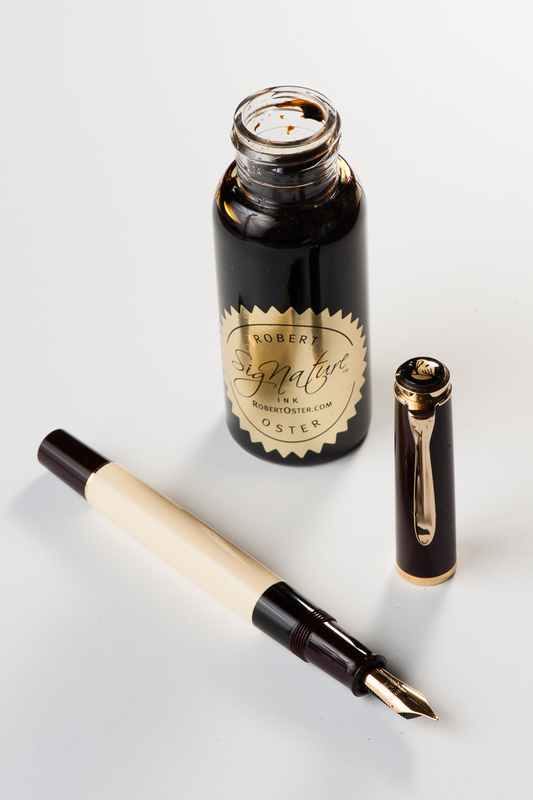 It’s also a great vintage ink for a nice vintage-y pen. 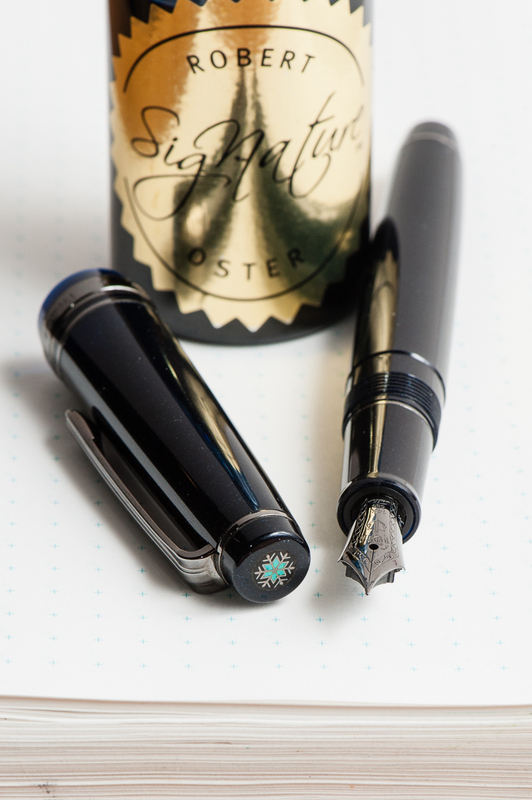 I chose to ink the Parker 45 as a homage to the Queen of ink, Susan Wirth. She recently passed away unexpectedly this month. I acquired this pen from Susie’s table at the 2016 LA Pen Show and it has an italic nib. If I’m not mistaken, the Parker 45 is one of her favorite pens as well. She’s also a great advocate of writing with Italic nibs. Susie was the first person who taught me about writing with an italic nib. I can still hear her distinct voice in my head as she says, “An italic gives you traction in your writing. Without it, it’s like a car that goes all over the road.”. 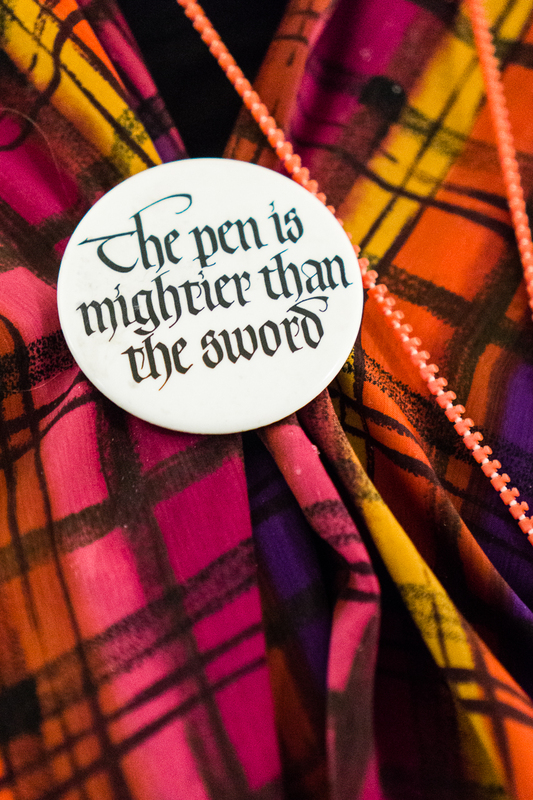 I met Susie at the 2012 SF Pen Show and I immediately learned a lot from her. At the time, I did not know that she went to every US pen show and that she had been attending shows since mid-1980’s. But as I continued to attend the LA and SF Pen Shows annually, I’ve learned how much of a big part of the community she is. At the 2016 LA pen show, I brought my mom along and when she met Susie, she got the Susan Wirth Experience. This resulted with my Mom buying her first flexible nib fountain pen. So just like me, my Mom learned a lot from Susie at her first pen show. Susie is already missed in the pen community but I know that she will live on in our hearts and in our writing. Thank you for everything Susie! Katherine: It’s still March as I write this — I’m picking a little early since I’ll be out of town for a lot of April. But, even though it’s March, I have no doubt I’ll keep this pen inked through April. 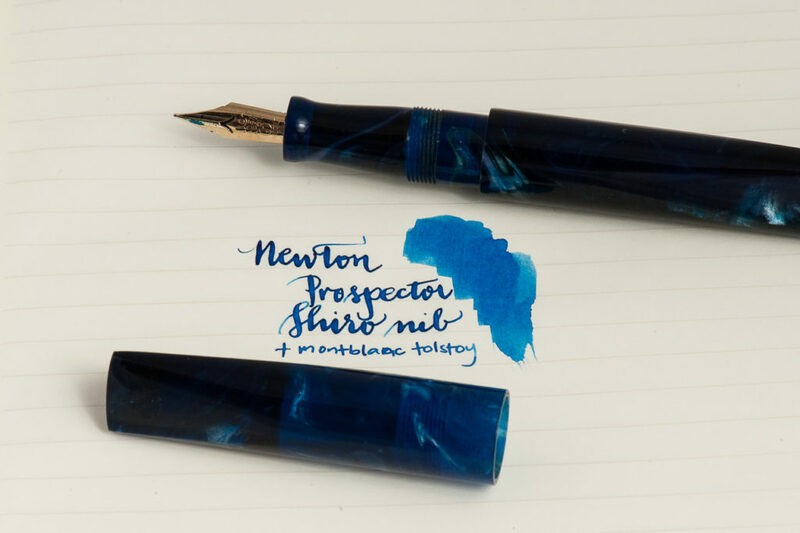 🙂 My pairing for the month is my new Newton Pens Prospector and Montblanc Tolstoy. I chose BSea’s Galaxy Trek resin, which reminds me of the deep ocean. It’s a dark, almost black, blue in many areas with swirls of lighter blue and even white and an occasional brown. I had to pair it with a blue ink, and I chose Tolstoy. There could be lots of reasons for this pairing… blue and blue, reminders of my childhood (swimming off islands in the Philippines and wondering what lurked in the dark waters… and my numerous failed attempts at reading War and peace as a 13 year old), but really it’s just because that’s the blue ink I had on hand when I ripped open the Prospector’s box a few days ago. I only had the presence of mind to record an unboxing video because my boyfriend, Shamiq, suggested it. Then I grabbed the bottle of ink on my desk, filled the pen and proceeded to oooh and aaah over the pen and the shiro nib. And, because I can see into the future, I’m sure I’ll still be ooohing and aaahing over this pen in a couple weeks. Pam: Spring is in the air! The air is still crisp and a breeze is still about. We still get the occasional rain this season, which just makes me want to curl up with a *mug* of coffee and a good book. 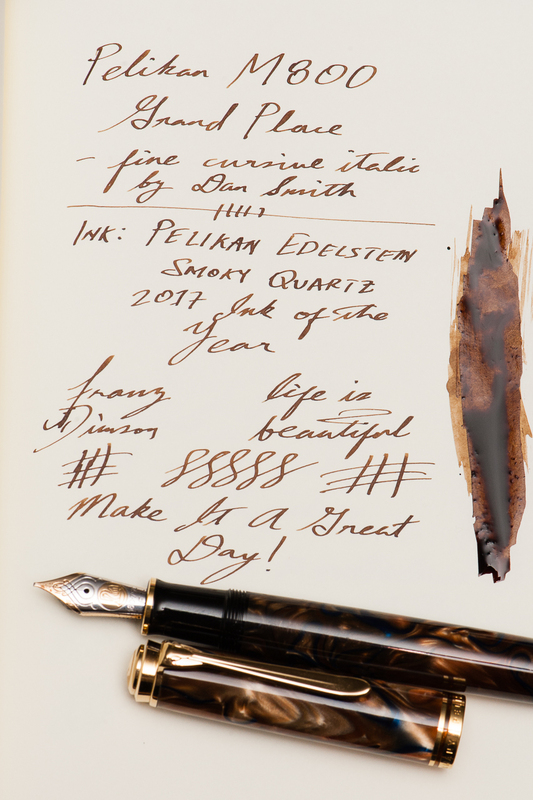 In lieu of that possibility, I chose Pelikan M200 Cafè Créme to be paired with Robert Oster Caffè Crema! 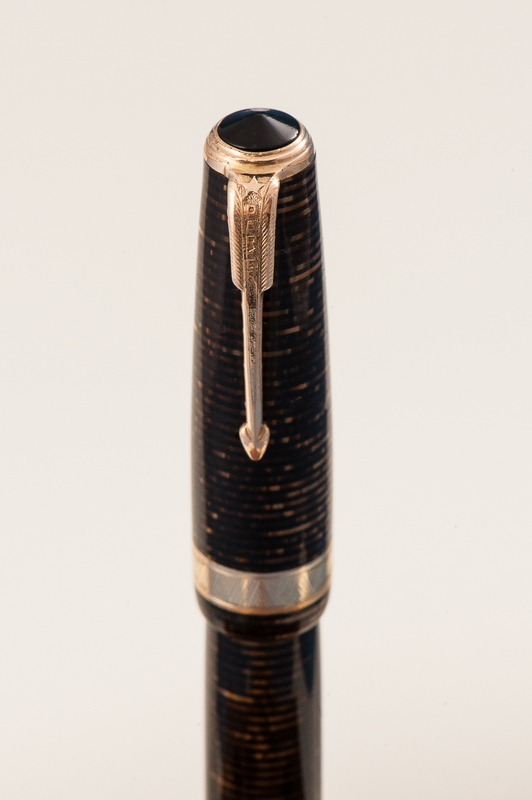 This particular pen has a wonderful architect nib done by Dan Smith of the Nib Smith fame. It shows off the subtle shades of this pen quite well and keeping a crisp line. I considered this combination for more of an autumn month, but my love for coffee, Robert Oster inks and Pelikan flocks is year round. 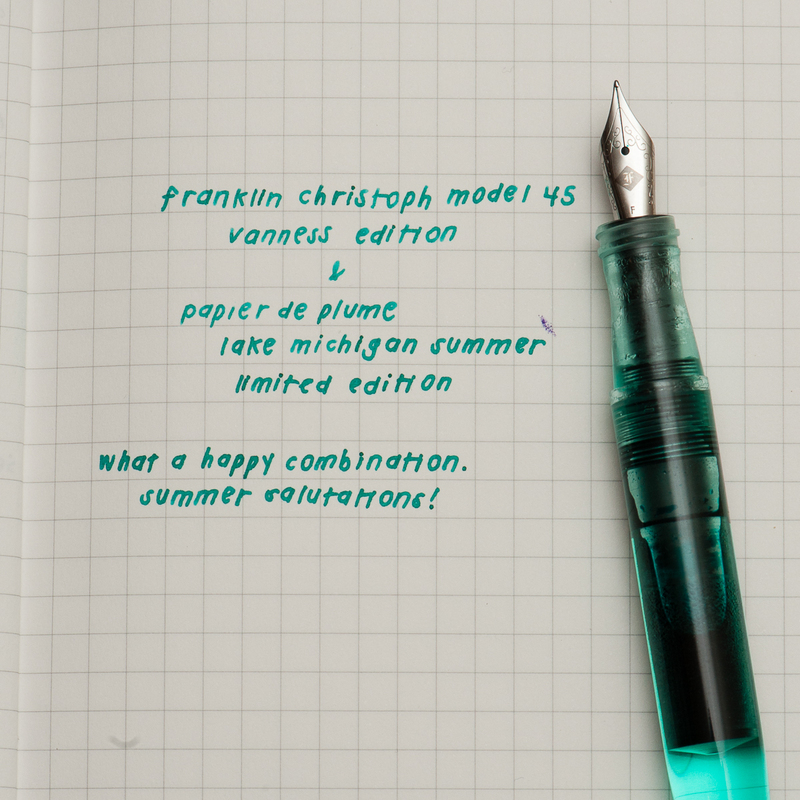 Franz: April’s pairing for me is the Pelikan M800 Grand Place Special Edition release, and the newly released Pelikan Edelstein Smoky Quartz which is their Ink of the Year for 2017. Now I’ve got quite a few.. ahem.. a lot of inked up pens especially after March’s 6 Pen Challenge so this month’s pairing is a true winner at the moment. 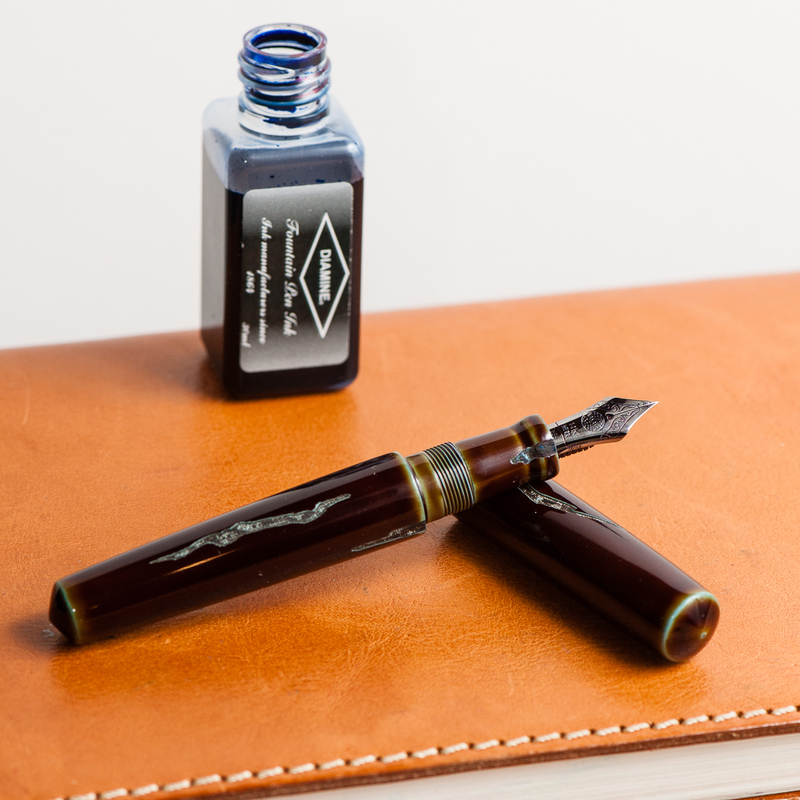 The ink is definitely a very nice brown which matches the creamy swirls of the pen. The nib of the M800 is a juicy fine cursive italic nib ground by Dan Smith (The NibSmith), and that generous flow creates spots in my writing wherein the ink pools to an almost black. So far, I’ve got only bought the ne bottle of this ink to test it out but I think a second bottle will be in my inventory sooner than later. While writing with the M800 Grand Place, I catch myself sometimes just pausing admiring the chatoyant swirls of the pen. It’s almost hypnotic. Thanks for your time, and keep enjoying your pens. And please tell us what new ink pairings you’ve discovered recently. Pam: I can’t take credit for this pairing; it was serendipity, actually. 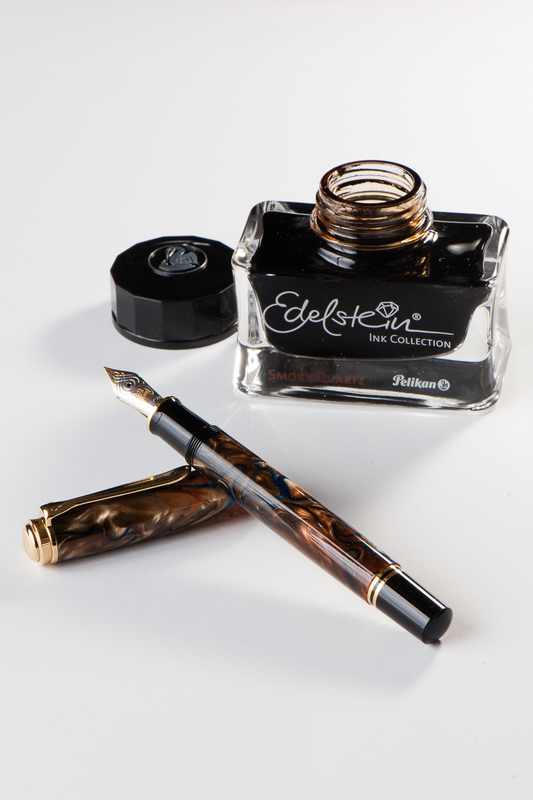 Robert Oster has made a stunning and wonderful ink that has caught the fancy of many pen lovers. 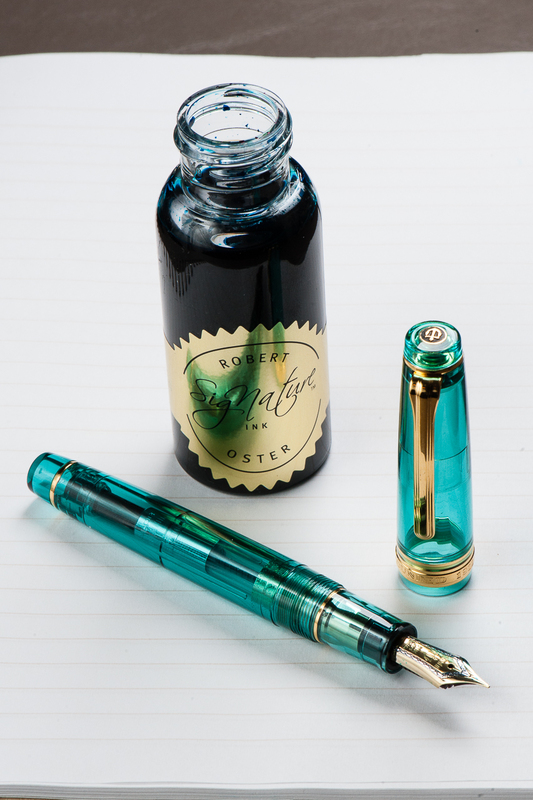 In the meantime, I was drooling over the turquoise Sailor from Wancher. They happen to arrive around the same time so ta da! Perfect match! 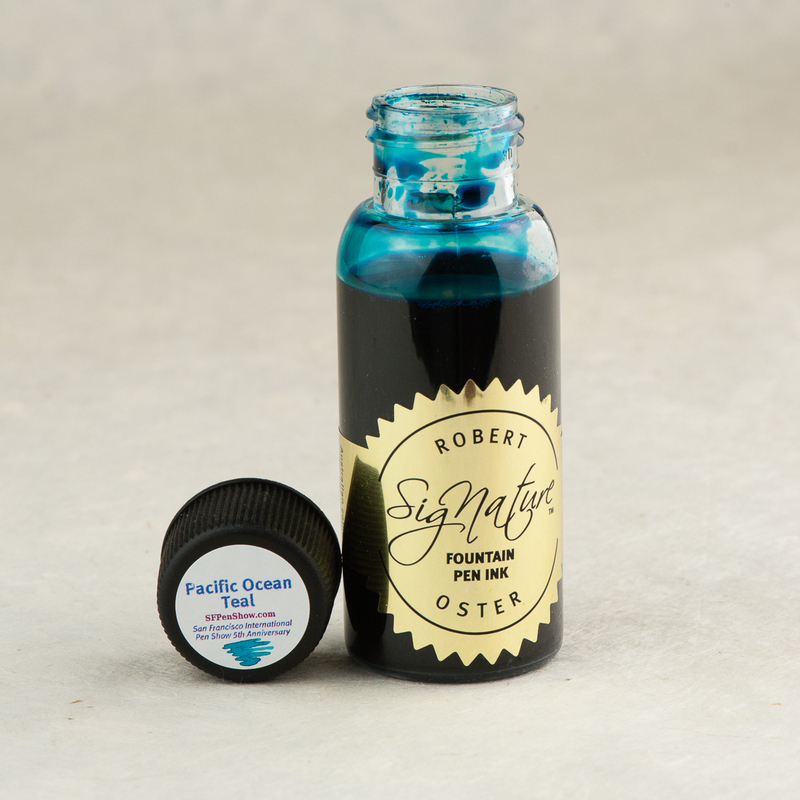 Robert Oster’s Fire and Ice is a beautiful dark turquoise with a great red sheen and is aptly named. The MF nib of the Sailor pen is a bit wetter and broader than my usual preference, but with this ink, I wouldn’t want it any other way. 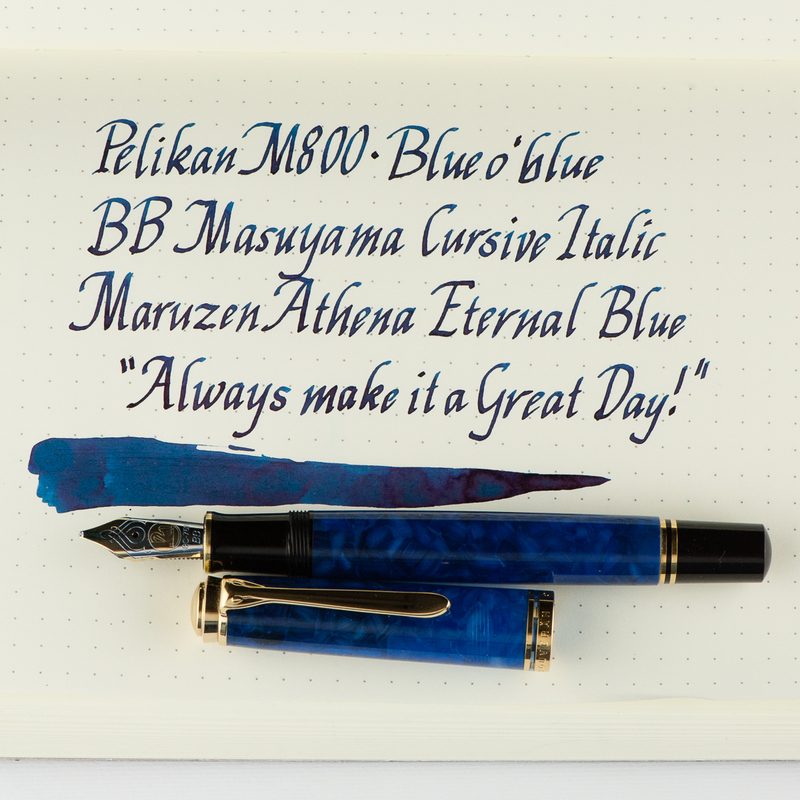 It’s the perfect nib for ALL THE SHEEN! 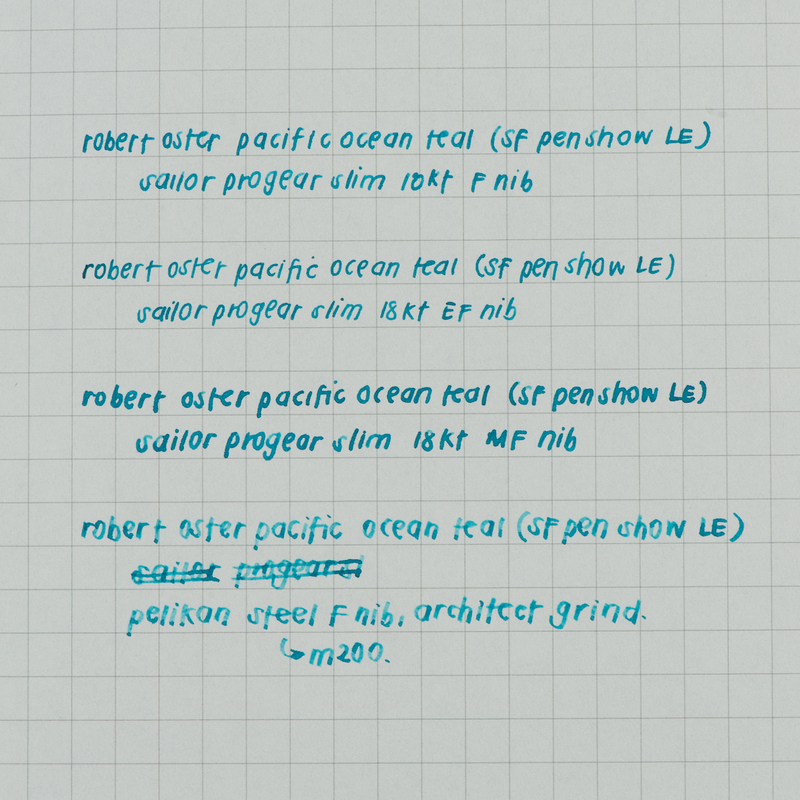 I am working on enlarging my microscopic penmanship to do justice for such a perfect OTP (one true pairing). Katherine: I picked this month’s pairing based on what I’ll be using the most — a custom faceted pen by Romulus Pens and Pilot Ku-jaku. John of Romulus pens made this pen as a proof of concept (Possibly because I couldn’t shut up about how much I loved facets while I was hunting for a Nakaya Decapod Mini) and sent it to me to test drive. I have a custom one on order and hope to see it in the next few weeks (hint hint). 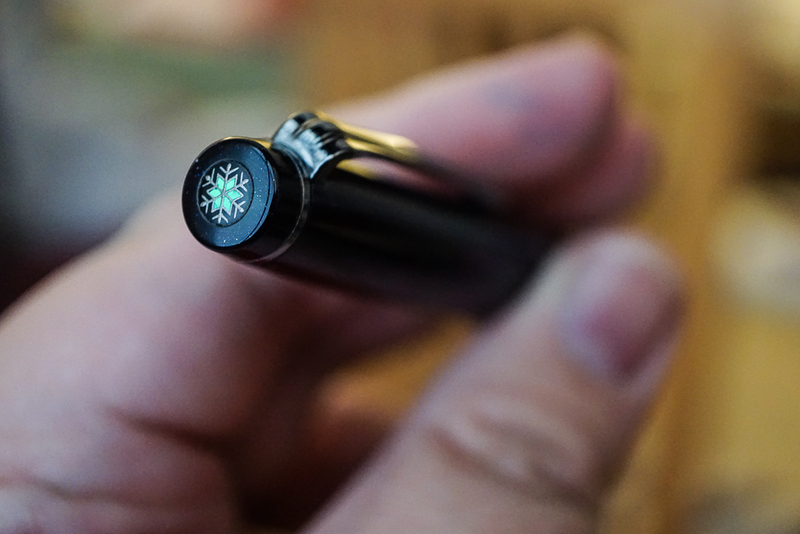 When the pen arrived, I was almost afraid to ink it up, the clear body its nine facets were so pretty — they reminded me of a prism. 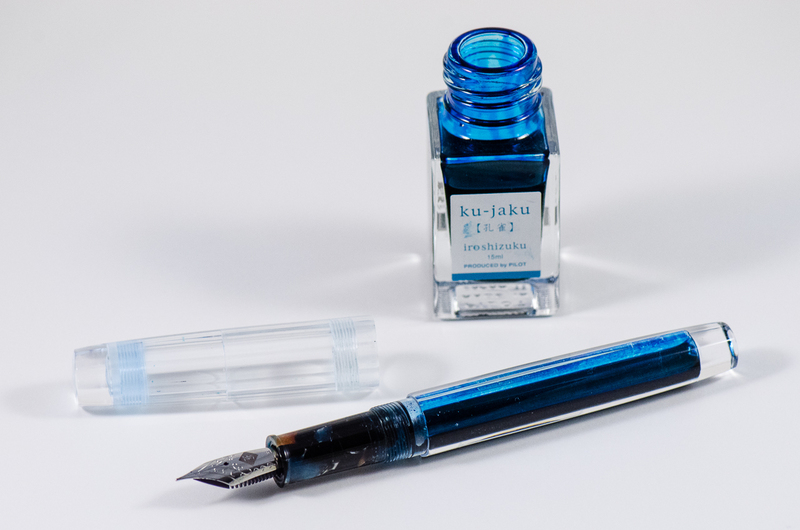 But, a pen is a pen and it’s meant to be used — so I picked Pilot Iroshizuku Ku-jaku. I wanted a bright ink since I’d see it sloshing around, but I also wanted something I’d be able to use at work without getting too many weird looks — so a bright blue it is! I’ve swapped a Franklin-Christoph Masuyama Needlepoint nib into it and it’s a joy to use… but I predict that I’ll be writing with this pen for a long time before I write it dry. 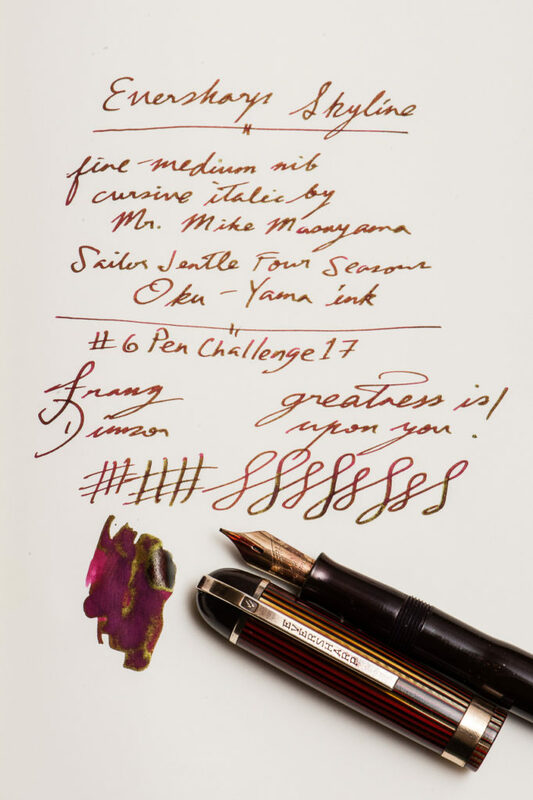 The Sailor Oku-Yama is such a perfect match for this pen because of the red/burgundy color and the nice gold sheen. This ink echoes the red and gold color of the pen quite nicely. Also at the 2016 SF Pen Show, I had Mr. Mike Masuyama turn the nib into a smooth Cursive Italic so it has been a usual pen in rotation for me. It’s got some nice springiness as well. This is a new series of posts for us. 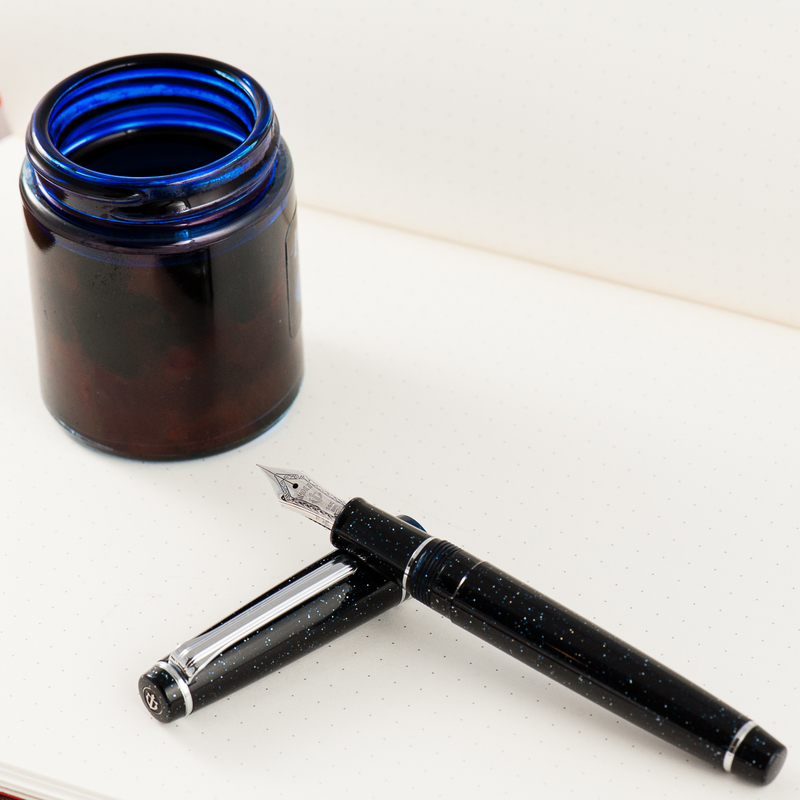 Each month we’ll pick a pen an ink pairing and share why we love it. What are your favorite pairings? And please give us feedback — we love comments! Pam: I tend to make pen and ink “one true pairings,” as in, once a pen and ink are well paired, they are almost permanently paired for me. My first OTP was the Lamy 2000, EF nib with Sailor Yama-dori. The Lamy 2000 didn’t sing, and arguably, a disappointment due to my original ink choice. I thought the nib was too wide, too wet, and created a “weird” line. 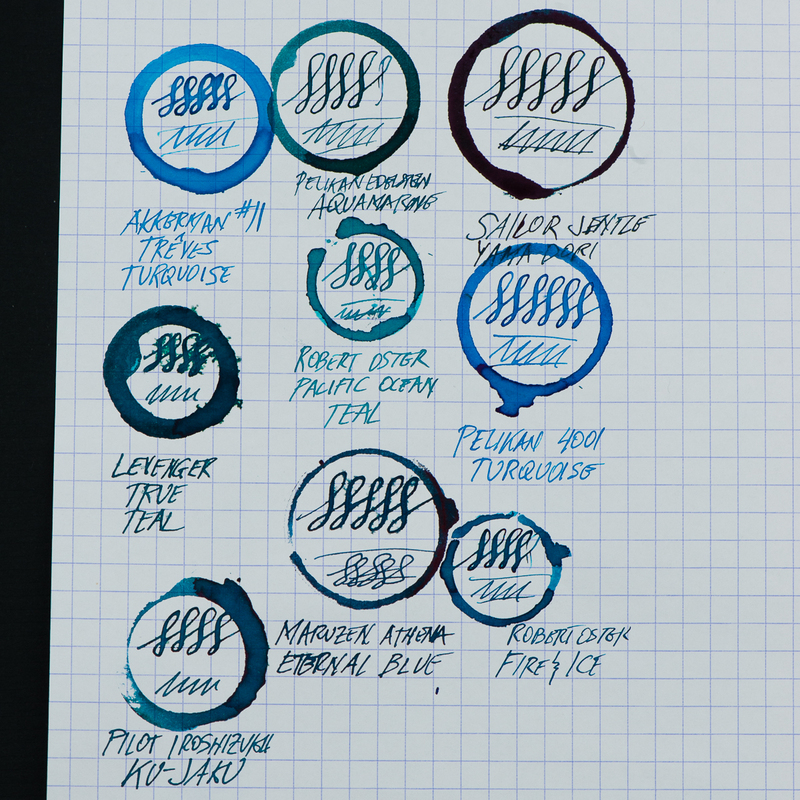 However, once I put in Sailor Yama-dori, thie “too wet” was just right to show off the beautiful red sheen on the perfectly teal ink. The “too wide” and “weird line” became a semi-architect because I could actually see the difference between my vertical and horizontal strokes. I haven’t inked up the Lamy 2000 with any other ink since its second inking. Katherine: If you follow me on Instagram, you’ll know that I got my first Nakaya (unboxing video here). Nibs.com had ONE ao-tamenuri (blue-green) Piccolo left, and I couldn’t resist. 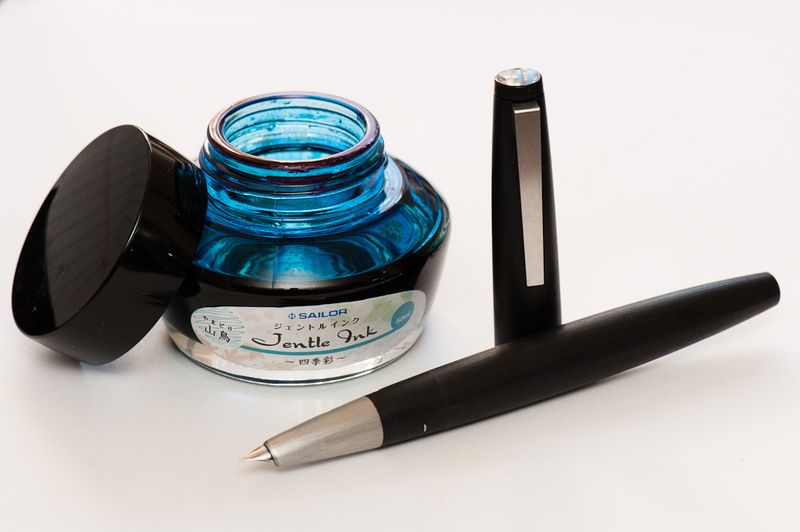 When the pen arrived I waffled over what ink to ink it with — something I knew I loved, or a totally new ink? I went with Akkerman #24 Zuiderpark Blauw-Groen, which I suspected would match the blue-green accents on the pen — and I was right! 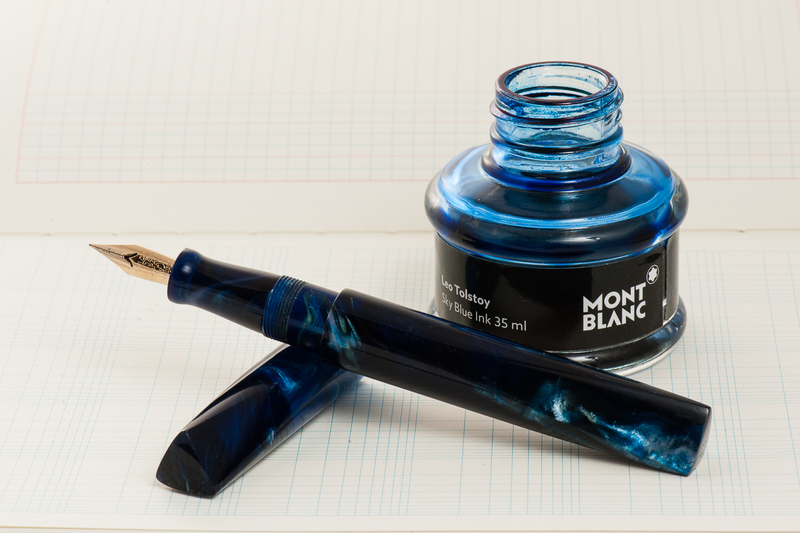 The ink flows well, but is on the dry side and matches the pen perfectly. 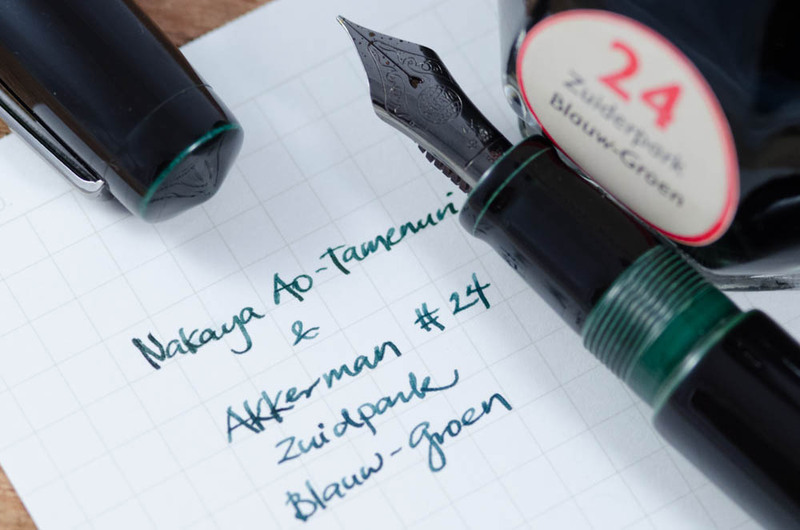 After reveling in my perfect match, I found out that Franz (who I got my sample of Akkerman #24 from) bought the ink to match his Ao-Tamenuri pen… great minds think alike! 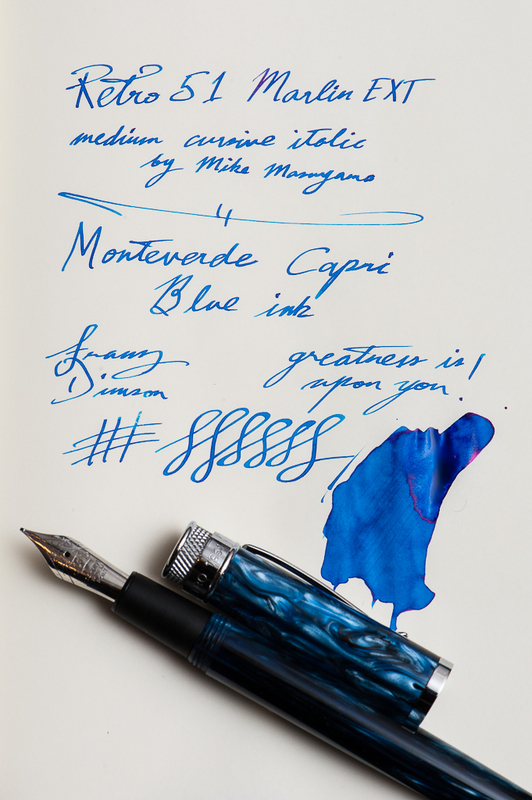 Franz: I’m excited about this post because I know that most pen folk are particular about the inks they use on their pens. I mean, that’s one of the biggest appeal of using fountain pens. 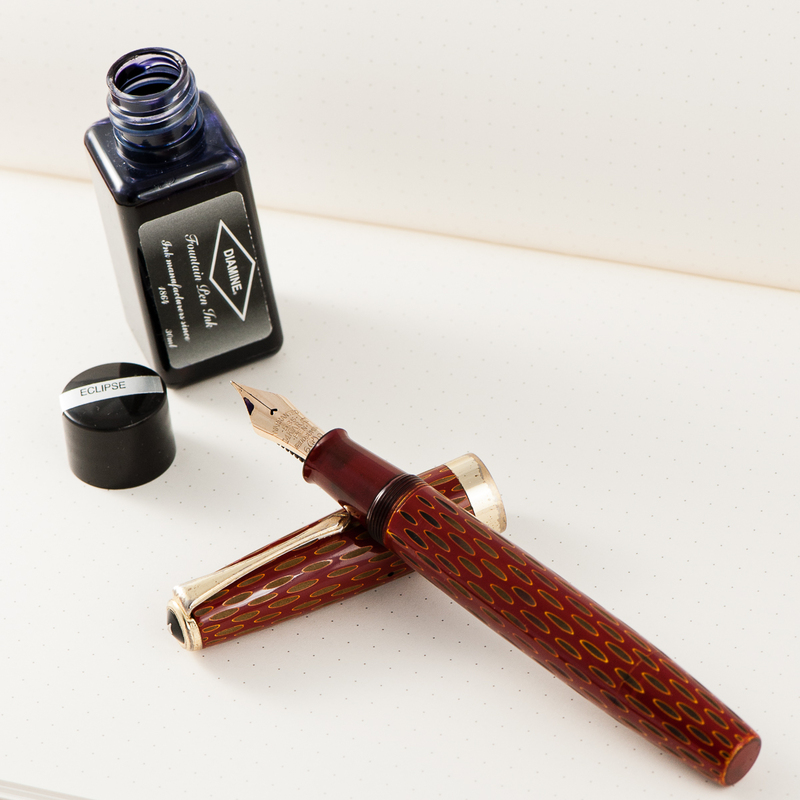 It’s the ability of being able to choose your preferred ink, your own nib size/grind, and the perfect size of the pen for your hand. We’re not even tackling paper choices yet. That may be for another kind of blog post. Haha! 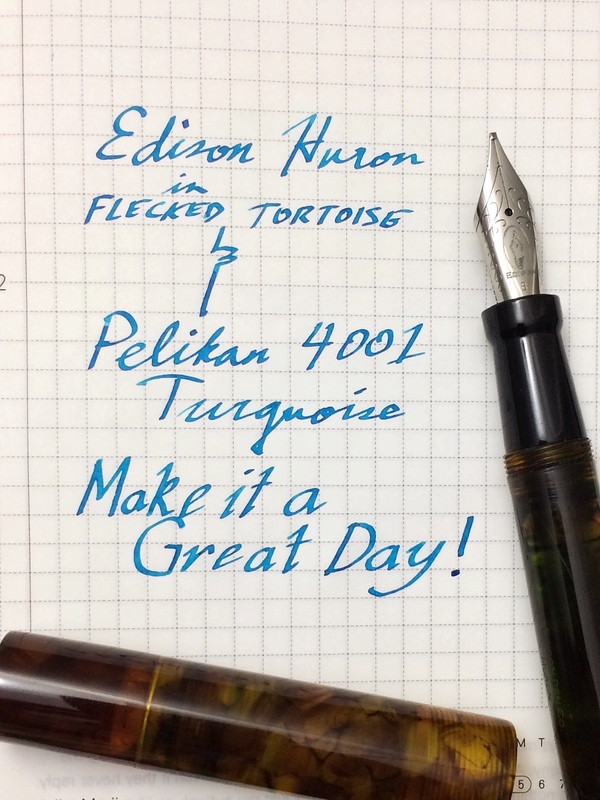 So for this month of January, I’d like to feature my pairing of my custom Edison Huron in Flecked Tortoise and the Pelikan 4001 Turquoise. 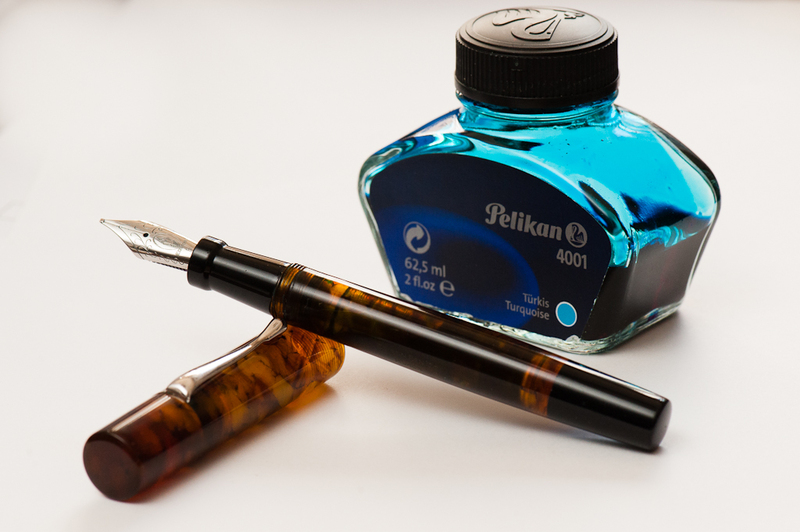 The Pelikan Turquoise has become one of my top 5 favorite inks for the past years and I’ve become accustomed to its properties. 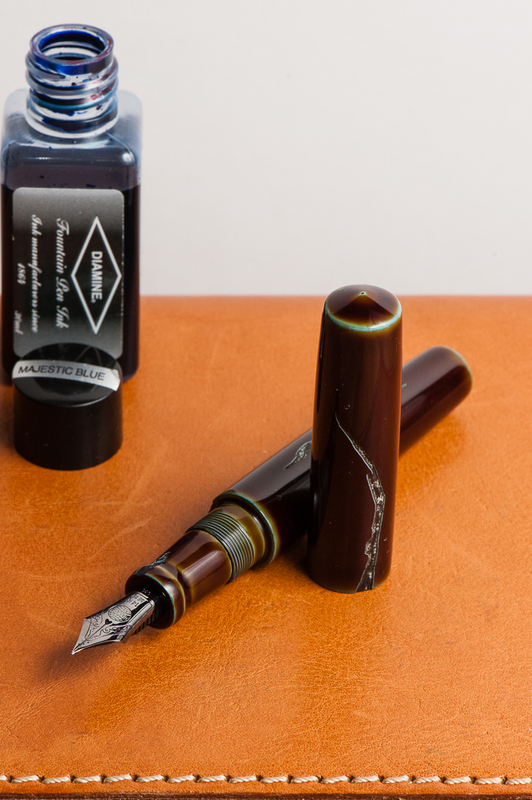 The color of this ink is a nice complement to the rich brown tortoiseshell acrylic. The Huron sports a broad cursive italic customized by Mr. Brian Gray and the width of the line shows off the ink’s color and sometimes its sheen. Following Pam’s strategy, this may be my O.T.P. for this pen. Don’t forget to let us know what your favorite pairings are! Thank you!